Hmm, I would love a Sherlock Holmes cameo...would the little profile with a pipe be darling? hate to say that (because it was mentioned in a comment before) but I'd love to own a cameo with Audrey Hepburn's face on it. She was such a gracious woman. Other woman besides Audrey, I'd say Jane Austen because she's such an inspiration for me! Easy: Barbra Streisand. That profile would be to die for. 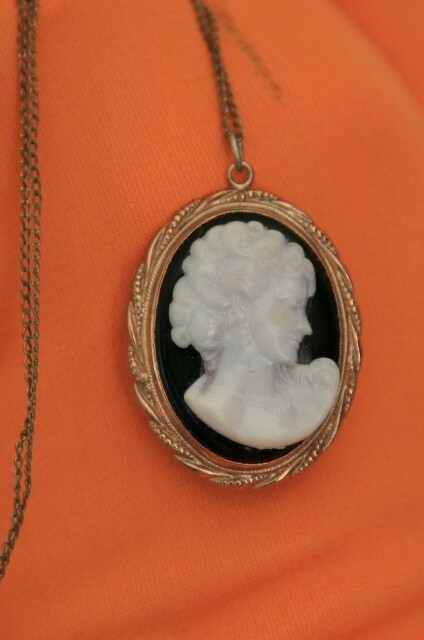 I'm satisfied with the commonplace anonymous victorian woman, but your face surely would look great on a cameo. your profile is perfect, haha! and great post, naturally. I follow you on bloglovin'... and I love your blog, you have such an amazing style! Hmm... I have been reading about art history for school, so I would have to say that I would love to see one of Degas' ballerinas on a cameo, they are amazing! I adore cameos! I love how elegant and vintage they look. I'd also like to see Audrey Hepburn on a cameo, her profile is gorgeous! I follow your blog with google. I would love to see the great Marylin Monroe on a cameo necklace. i would like a cameo with my mother's profile on it, just because i think she's beautiful and it would have a personal value! I follow and love your blog. But, I live in Australia so would I be able to eneter? I would love a cameo with charlotte brönte without a doubt or maybe emily since her profile is a lot more romantic. Your pictures are beautiful, I'm always dreaming about wearing scarves around my head but I'm too much of a coward to do it. What I love about cameos is how timeless they are in the change of silhouettes throughout each decade. So, in ways of answering your question, I would love to have a 1920s cameo. From the ones I've seen their curled bobbed hair and flapper looks make a lovely silhouette. However to narrow it down to a more specific character I would choose either Ophelia or the beautiful girl from my favourite painting La Liseuse by Jean-Jaques Henner. If you don't know it, look it up, it's breathtaking! I would love a cameo with Helen Bonman Carter's profile on it, she is just so eccentric and amazing! I think Marilyn Monroe would be stunning! PS: you look amazing. seriously like a magazine ad. in a good way. That first photo is amazing! You look amazing! So classic! 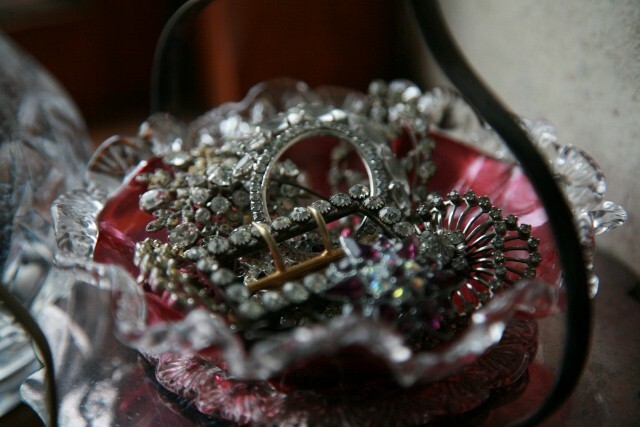 I am in love with your dressing table Ros. I've just had to move mine to the spare room that is being converted into a mini-vintage boutique, so I no longer have a special little space of my own, sob! At least it will be nice to share it with others, I'm planning on using it to display hats and trinkets. No doubt about it: Greta Garbo! She had such stylish and characteristic contours to her nostrils and lips. And her life as a Hollywood/Stockholm recluse seems befitting of the introspective mood of a cameo. The post is great! Thanks so much Roz! Of course I follow you dear! 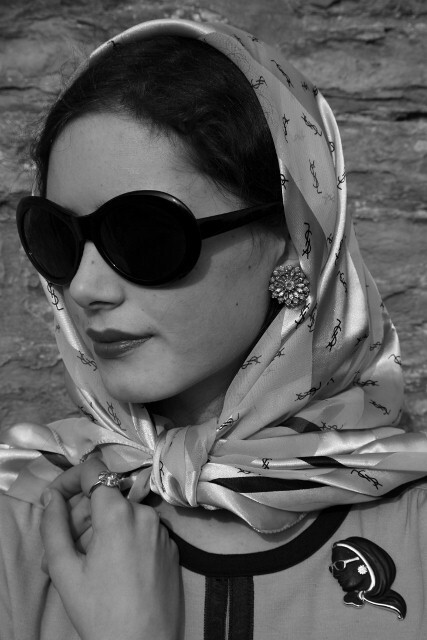 And I'd love one of those with a Jackie-O cameo.....complete with her oversized shades & stylish bob! Sigh!! Wasn't she just gorgeous??? I follow via Google RSS. I think Brigitte Bardot or Barbara Streisand would make interesting cameos. great giveaway! I know that this has already been said a million times but I would love to see a cameo with Audrey Hepburn's face on it. Gorgeous post, I love how you've completely captured the profile of the brooch down to the finest detail. At the moment I am completely obsessed by the sixties and I think the Beatles would look great on a necklace like this. It would add a twist to a classis piece necklace! Ohmygosh. If I could have a cameo of any Victorian looking woman, but Twiggy, Cleopatra, Audrey Hepburn, those are all fantastic ideas. 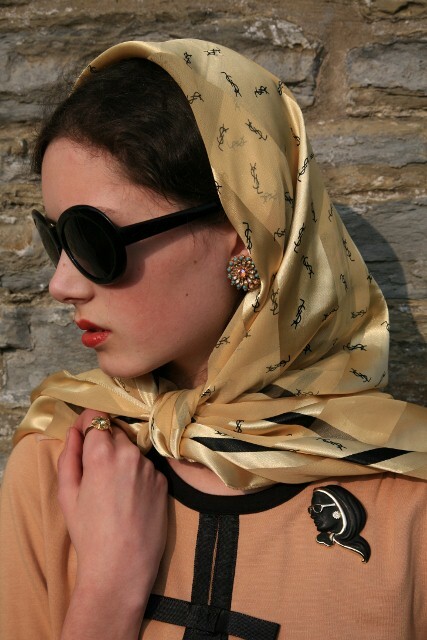 What a wonderful idea, echoing the woman in the brooch with your own scarf, earrings, and pose! And I love the pirate treasure game -- I ant to play it right now. I'll have to teach it to my kids when they're a little older -- I have lots of careworn vintage jewelry that would make for a good trove. Hmm...I'm a follower, and I'd love to win the cameo. Whose profile would I like to see on a cameo? Queen Elizabeth I, complete with ruff. I would love to Tilda Swinton on a cameo. She's so androgynous and beyond talented/beautiful. Also, I must tell you how much I adore your style blog. So much inspiration to be found. I'm totally in love with your blog. You are a real inspiration for me! I love your blog! Personally I would like to see Audrey Hepburn on a cameo. your blog is amazing! I'm not sure if I follow your blog as I don't have one myself but I have subscribed to automatic feed posts if that counts? Anyways just in case I think a cameo of Marilyn Monroe would be great because she's so iconic! I think for me it'd have to be someone a bit bizarre, maybe Tony Blair. Or maybe Maggie Thatcher - she's got the profile for it. Julie Andrews would be awesome i think. The jewelry is beautiful, but I have to say that I love those orange gloves! i think Kate Moss would bring a fresh approach to cameos her, very individual face shape and undeniable beauty would make an interesting statement as a cameo for sure. Modern day cameos would be cool- Lady Gaga in profile!!! Came here to say thank you for your lovely thoughtful comment, and started scrolling back cause I've missed some good posts. 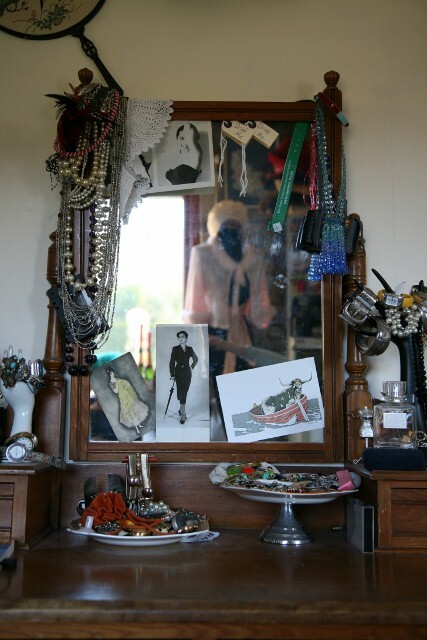 It's great to have a peek into your 'wardrobe' - I love the shots like the shot of the dresser (and you mum posing in the orange gloves: I had a pair just like that, right around the time I first met Mr. Dot! I wore them everywhere: it was just a stage I was going thru: embracing orange). I loved cameos as a child. 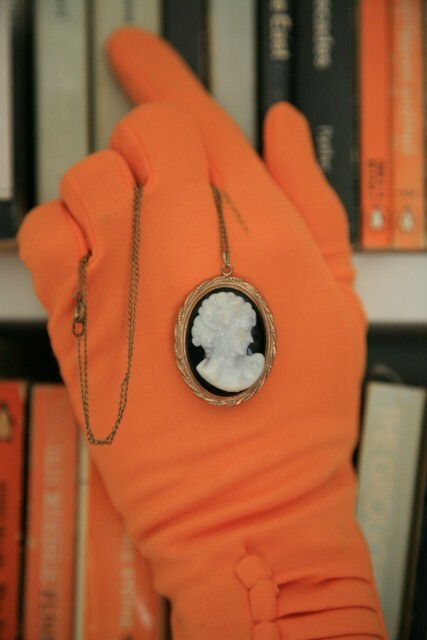 I just remembered a cameo ring I had: I wonder if I still do. Who would I want on the face? Good question. I know: just because I'm seeing her films right now: Liz Taylor. She's gorgeous. Or for a striking profile: Cher, before she had all that work done.